Jim Zub’s 2014 is picking up some real speed right now. 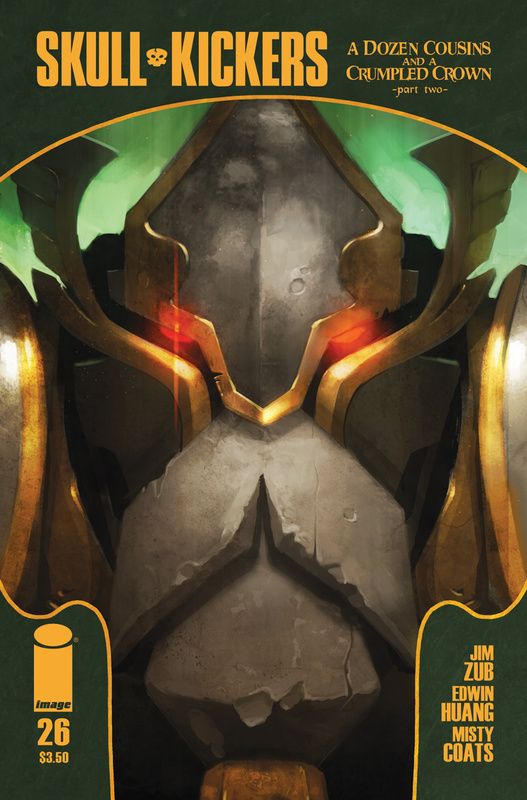 Most well-known for his series Skullkickers with Edwin Huang and Misty Coats, which is soon heading towards the penultimate arc, he’s building up a head of stream to take him straight through into 2015. Alongside his creator-owned fantasy sword-swinging monster-kicking fighty fight series, he’s also now writing various projects for DC, Marvel, Dynamite and many others. One of the most interesting things about Zub as a creator, and what first caught my attention, is his openness about his career and creative process. The extensive comic book tutorials on his website offer some brilliant advice on a range of topics, from publicity to building a creative team, and right through to the tricky stuff nobody else talks about – like, for instance money. Which means there’s a lot to talk to him about! Ahead of issue #25 of Skullkickers – which you’ll get to see preview pages from below – he spoke to me about building Skullkickers, assembling the team, and how he’s managed to keep interest in the series so high. Steve: Skullkickers started as two short stories in Image anthology collections. Why take it to an ongoing series? What about the characters or world made you want to continue on with their story? Jim: Erik Larsen, who was publisher at Image when the Popgun anthology came out, really liked those two short stories. He was the one who asked if we wanted to do a full comic with the same characters. I think the concept, two mercenary monster-mashers get themselves into capers and have to violently find a way out, lent itself to a continued adventure. It was open-ended and became a vehicle I could use to explore and poke fun at well worn fantasy storytelling tropes. Steve: The original two shorts were with Chris Stevens, although for Skullkickers proper you’ve been working with Edwin Huang. How did you connect with him? Jim: Chris and I did the Popgun stories and he was originally on board as the artist for the proposed 5 issue mini-series, but in order to work on the regular series with any regularity he’d need to stop doing freelance work for months at a time and financially that just wasn’t possible. Add in some other curveballs that were thrown into his life and it quickly became apparent that it wasn’t going to happen. I mothballed the Skullkickers first issue script and expected it would never be illustrated. Cut to about a year and a half later. Edwin was getting ready to graduate from art school and he’d contacted the UDON studio, where I was working as a Project Manager, looking for a job. There weren’t any positions available but I liked the quality of his samples so he and I stayed in touch. I recommended that he have more sequential samples in his portfolio and, when he asked if he could work from one of my scripts, I passed him the script for Skullkickers #1. Within a few pages I could see that he’s be a great fit and thankfully he felt the same way. He finished up issue #1 and I re-pitched it to Eric Stephenson, who gave it the green light. Steve: What about his art drew your attention? Were you looking for something particular for Skullkickers? Jim: Edwin’s style is clean and crisp with clear storytelling and great expressions. It’s cartoonish where it needs to be without slipping into something too exaggerated or loose. Even when he’s drawing grim and violent stuff there’s a playful quality to it that reminds me of Mike Wieringo or Paul Smith. Steve: Misty Coats has been colouring the series since the start, and has become a firm part of the creative team. Did you invite her to the series, or was she recommended by Edwin? Jim: Misty was recommended to me by colorist Christina Strain. We had line art all done for issue #1 and I knew that Christina knew all kinds of colorists who were just getting their start. I showed her the line art and explained the colorful-animated look I wanted for the series and she suggested Misty. The first two pages of issue #1 are actually Misty’s sample pages. They were perfect. Steve: As the series has gone on, how do you feel that the style of the comic has changed? Do you think that, as you’ve all grown closer as a creative team, you’ve experimented more? Jim: When I’m in the midst of working on an issue it kind of feels like it’s always looked the same, but when I refer back to earlier issues and compare I’m amazed at how far we’ve come. There’s a far greater understanding of how we all work well together – the humor, the art, the lettering, all of it. I’m not afraid to try weird things and the rest of the team trusts that there’s a method to the madness, which is very encouraging. With work for hire I always send a completed script whereas with Skullkickers I’ll sometimes just send Edwin a handful of pages to work on as I squeeze in some Skullkickers writing time inbetween other projects. He’s an absolute pro and just rolls with it. Steve: Although obviously it’s great that Skullkickers has continued on for such a long time, does it also get harder to promote and talk about the series, the longer it continues? Have you found that attention starts to fall off a little over time, and PR becomes more important? Jim: Absolutely and it’s something that’s really hard to explain to people. Getting readers to stay excited and committed to a longer running series can be quite difficult. There’s an understandable obsession with the ‘new’ thing –new series, relaunches, the latest announcements. We’re all guilty of jumping to the new shiny thing and taking older stuff for granted. That’s the kind of thing we mocked with our 5 new #1’s in 5 months thing last year (Uncanny Skullkickers, Savage Skullkickers, etc. ), but it’s become bizarrely prophetic since then. Steve: How did that relaunch/rebranding idea come about – and did it actually prove to give the series a boost in sales? Jim: Like a lot of the jokes in Skullkickers that relaunch/adjective thing happened because I wanted to take something real and exaggerate it to a ridiculous degree. The sheer number of first issues that were being announced at the time, with the DC New 52 and Marvel Now at the forefront, was mind-boggling. It felt like every bit of promotional press was being sucked up by those first issues and that a bunch of wonderful long running series weren’t getting any attention at all. I love that books like The Walking Dead, Invincible, and Savage Dragon have been able to continue doing what they do issue after issue, arc after arc. Artists like Ryan Ottley should be lauded for their commitment and consistency, but that’s just not how the attention span of the industry seems to work. Skullkickers is a funny book and I felt like we could poke holes in relaunch-itis by pushing it to an extreme. I figured we’d get some interest and mild amusement, but I didn’t anticipate that we’d almost double our sales for a few months and be a talking point in the whole relaunch culture. That was unexpected. Our print sales settled back down over time, but I could instantly see why publishers get so tempted by that shiny red ‘first issue’ button. It’s Pavlovian. Readers and retailers respond. Steve: Do you think that comics can even be pitched as lasting for, say, fifty issues anymore? Do you think we’re heading (as companies like Marvel seem to be considering) into a place where stories last for a set run, maybe 12 or so issues, and then wrap up the storyline? Jim: Skullkickers wasn’t pitched as a long run and I doubt many stories are or should be, to be honest. I think it’s good to plan a story that could work in a shorter run but has potential to go further and delve deeper if the market responds well to it. Better that than expecting a massive run and having to truncate it awkwardly when it doesn’t work out. Superheroes function as a perpetual license extension of the characters and concepts, so they defy standard storytelling expectations or most finite runs, but I think this is where creator-owned comics work so well as a singular vision of those creators. The length of the comic is built for the story, whatever that may be. I love that John Layman can say “Chew will be 60 issues” once it launches successfully – and then carry that out. Steve: How soon into starting the series did you plan out your ‘exit plan’, so to speak? At what point did you decide how the story would end? Jim: When sales numbers came in for issue #3 Eric Stephenson asked if we wanted to make the series ongoing. At that point I sat down and planned out the bigger story framework, with six arcs as my ‘ideal’ length. When I wrote issue 4 I started foreshadowing future storylines and we’ve rolled it out from there. Although I wrote other comics before it, Skullkickers really feels like the start of my comic writing career. I’m really happy we’re going to see that 6 arc master plan through. Steve: How do you think the comic market responds to comedic titles, at present? It seems like recently there’s been a visible movement towards comedic titles like Quantum & Woody, Deadpool, Harley Quinn and so forth. Jim: It shouldn’t surprise anyone that people want to enjoy their escapist entertainment and that stories that bring a smile to their face have great value. That I even have to explain this to people is kind of ridiculous. People like being happy – Full stop. Bringing joy to an audience is not something to be ashamed of. Marvel’s capitalized on this very well with their movies. Each and every one of the Marvel Studio films is a crowd-pleaser with a strong mix of action and humor. When people leave the movie theatre they’re smiling and are quick to recommend them to others. Thankfully comics seem to be finally shaking off the “we’re serious, dammit, so please take us seriously” shtick. You get reflected back what you give. The industry tried serious grim self-loathing for the last 25 years and that’s what it got back in return. I have serious stories in me but, by and large, I want to read joyous energetic adventure and that’s what I tend to put into my work. Call me crazy, but I want to write raccoons with laser machine guns more than brooding navel gazers with blackened seeds of hate in their heart. Steve: Issue #25 of Skullkickers is out this March, heading towards the penultimate story arc for the series. As you start to wrap up the overall story, what can readers expect from the next few issues? Jim: In our third story arc we delved into Rex’s past and showed where his golden gun came from. This story arc, A Dozen Cousins and a Crumpled Crown, will show more background on Rolf, our pint-sized murder machine. 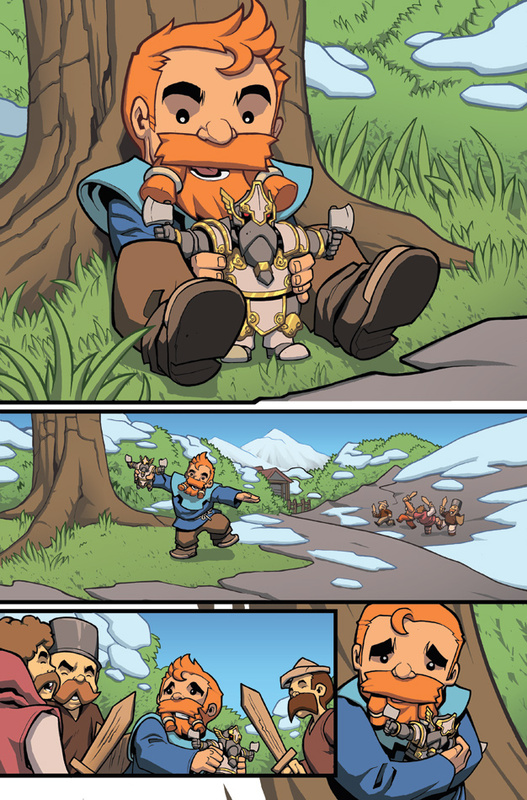 Expect lots of dwarves – dwarven problem solving, dwarven history, and dwarven justice. All of the seemingly random and ridiculous threads we’ve put out in the first four story arcs are starting to tie together in weird and wonderful ways. If you’ve been reading from the beginning you’ll see larger patterns emerging, but the current story is still fun and accessible. It’s still all about frantic fantasy fun. Steve: While Skullkickers may be wrapping up shortly, you have a number of new projects coming up – you’re writing Samurai Jack for IDW, you have an Amanda Waller one-shot at DC Comics. How do you balance your various projects against each other? Jim: Probably the most valuable thing I learned while working at UDON was how to gauge my own productivity and how to break larger tasks down into smaller more manageable tasks I could schedule around. On an ongoing series you’re always multi-tasking – Issues are being planned, solicits are dine up, scripts are written, pages are being drawn, coloring and lettering is being proofed. It’s a constant barrage of material on 3-4 issues at the same time and it’s never boring. I enjoy the process and, more often than not, I enjoy having a lot of different projects on the go at once. Steve: A repeated mantra in comics is “it’s not hard to get into comics – it’s hard to STAY in comics.” Is it difficult to keep a sense of momentum, as a creator? Jim: I think you go through little personal booms and busts, definitely. You can get neurotic about whether or not you’re doing it “right”, whatever that means, and where things might be a year from now, 3 years, 5 years. All of that just distracts you from doing the best job you can in the here and now. I try to just focus on making my current writing the best it can be and hope that readers, retailers, and editors enjoy what I’m doing enough to keep asking for more. If creators want to be visible and stay in the business they need to keep creating and that’s easier than ever. Digital outlets, conventions, and publishers of all sizes coupled with professional quality art/publishing tools at our fingertips gives almost anyone the ability to create and get in the ring. Steve: What else do you have coming up over the next year? Do you have any further creator-owned projects in the works, at all? Jim: Honestly, it’s pretty nutso right now, in a good way. If you total up the projects that have already been announced with projects that haven’t been revealed yet I have 7 different comics I’m working on with 6 publishers – Marvel, DC, Image, Dark Horse, IDW, and Dynamite. I’m excited to show people a greater range to my work. At least one of those is a new creator-owned series that I think that’ll turn heads when it’s revealed in a couple months. 2014 is incredibly exciting so far and I can’t wait until people see what’s coming up. I hope that if people are enjoying Skullkickers, Samurai Jack, or Pathfinder they’ll check in with other comics I’m working on as they’re announced and released. The best way to keep up on what I’m doing is through my website: www.jimzub.com. In addition to announcements and interviews I’ve got tutorials about writing, pitching, and working in comics that people may find helpful. Many thanks to Jim for his time! 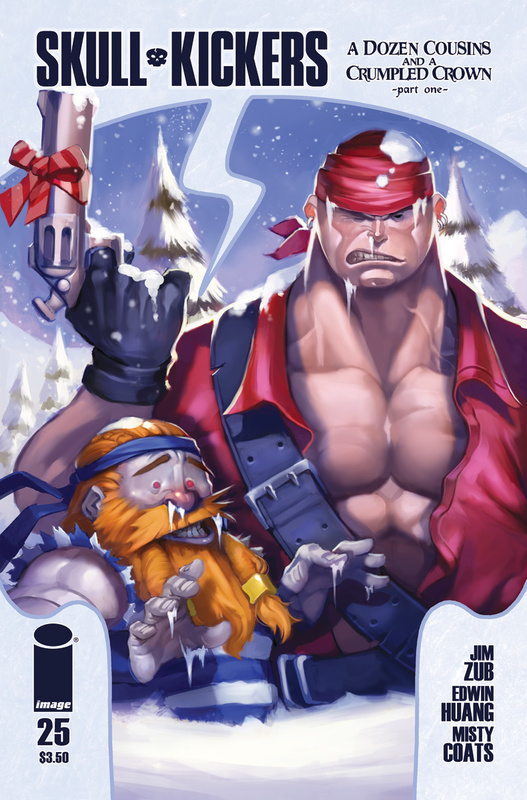 Skullkickers returns after a hiatus this March with issue #25 – the final order date being March 3rd. As mentioned, you can find out more about Jim on his website – or follow him on Twitter! Jim is one of the best people in the industry. He’s always teaching and always learning then willing to share to help others grow. Not many people understand the entire process of writing and publishing like Zub.